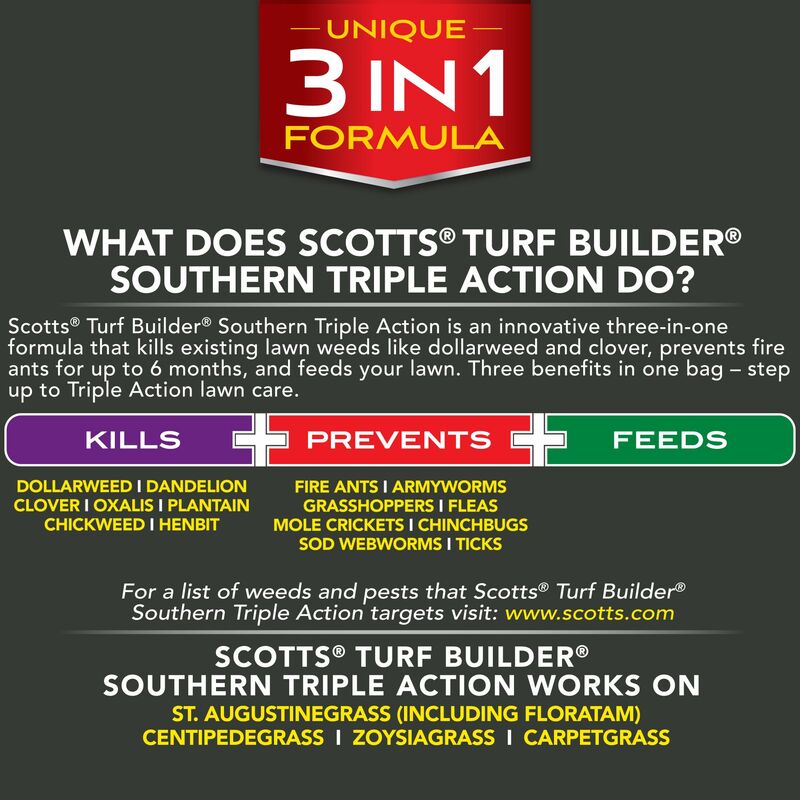 Scotts® Turf Builder® Southern Triple Action is a innovative 3 in 1 formula that prevents and kills fire ants for up to 6 months, kills stubborn weeds like dollarweed and clover, and feeds and strengthens your lawn against Southern stresses like heat and drought. 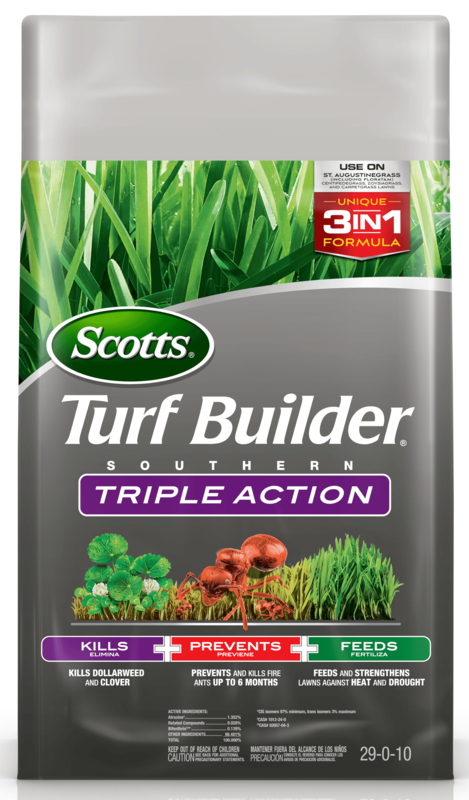 Scotts® Turf Builder Triple Action South is for use on southern grasses, like St.Augustine (including Floratam), Carpetgrass, Centipede, and Zoysiagrass. Use on St. Augustinegrass (including Floratam), Zoysiagrass, Centipedegrass, and Carpetgrass lawns only. Apply to dry lawn: Make sure grass is dry prior to application. Fill and Set Spreader according to spreader settings on label. Water-in product to lawn after application. Do not water to the point of run-off. Clean-Up: Sweep product from hard surfaces onto the lawn. Do not apply during winter dormancy period. Wait until after third mowing of the season to apply. Do not apply to lawns or mixed lawns of Bahiagrass, Bermudagrass, Bluegrass, Fine Fescue, Bentgrass, Ryegrass, Tall Fescue, or Dichondra because injury may occur. 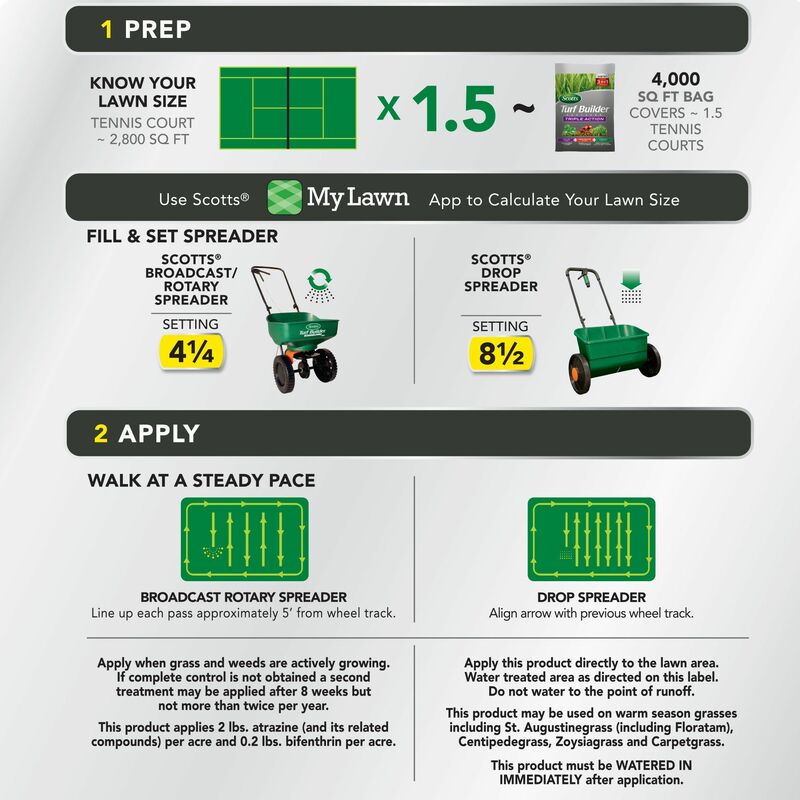 Apply when grass and weeds are actively growing. A secondary application may be applied 8 weeks after the initial application, but not more than twice per year. Scotts Broadcast Spreader: 4 1/4. Weeds: Dollarweed, Clover, Dandelion, Chickweed, Purslane, Burclover, Black Medic, Blue Toadflax, Buckhorn, Carolina Geranium, Dichondra, Evening Primrose, Florida Betony, Florida Pusley, Fragrant Cudweed, Henbit, Lippia, Oxalis, Pepperweed, Red Sorrel, Rescuegrass, Shepard's Purse, Sowthistle, Stinging Nettle, Venus Lookingglass, Wild Mustard. Bugs: Ants, armyworms, billbugs, black turfgrass Ataenius, chiggers, chinchbugs, crickets, cutworms, earwigs, European crane fly larvae, fire ants, fleas, grasshoppers, leafhoppers, mealybugs, millipedes, mole crickets, sod webworms, spiders, ticks, and weevils. To help protect the environment, sweep any product that lands on a driveway, sidewalk, or street, back into the treated area of the lawn to prevent run off to water bodies or drainage systems. Do not allow people or pets to enter treatment areas until watering-in is complete and the surface area is dry. Do not apply this product in a way that will contact any person either directly or through drift. Keep people and pets out of area during application. Sweep any product that lands on a driveway, sidewalk, or street, back into the treated area of the lawn to prevent run off to water bodies or drainage systems. People and pets may enter the treated area after product is watered in and area is completely dry. Apply this product after the 3rd mowing of the season. Water-in product immediately after application. After application expect control of listed weeds/bugs and lawn feeding.